Hello fellow cows and calves! Today I bring you an udderly bovine manicure! For this, I used China Glaze Snow as my base color and China Glaze Sugar High for the cow mouth/nose. Then, for the cow spots I used China Glaze Liquid Leather with dotting tools! Click the image below to see Alexis' oinkin' manicure! Yay! You did the cows! And better then I thought with the cow face! This is adorable!!! I love the pink nose! Thank you! I wasn't sure if anyone would pay attention to that, haha! 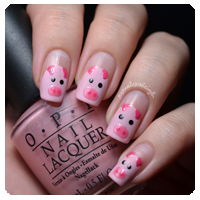 pig and cow, so cute! Thanks, Traci! Haha, we were talking about that before the post. awww so cute nd sassy! I really like it :)..P.S i grabbed your button for my blog today! Heehee I love cows, and I LOVE this manicure! It's so cute! Awwwww! This manicure moooooves me ;-) Does it make you want steak, Christa? ;-) Is that totally inappropriate? LOL!! Oh jeez, you crack me up, Jayne! It does make me want steak now that you mention it, if it is then I guess I'm inappropriate! Haha. LOL, let's be inappropriate together. I hope whoever reads this comment reads the above comments for context! oh these are toooo cute!